I'm excited to see what everyone pins, what you really like, and what people are looking for. It will show me too, what is popular among everyone so that way I can continue to provide things that everyone enjoys! 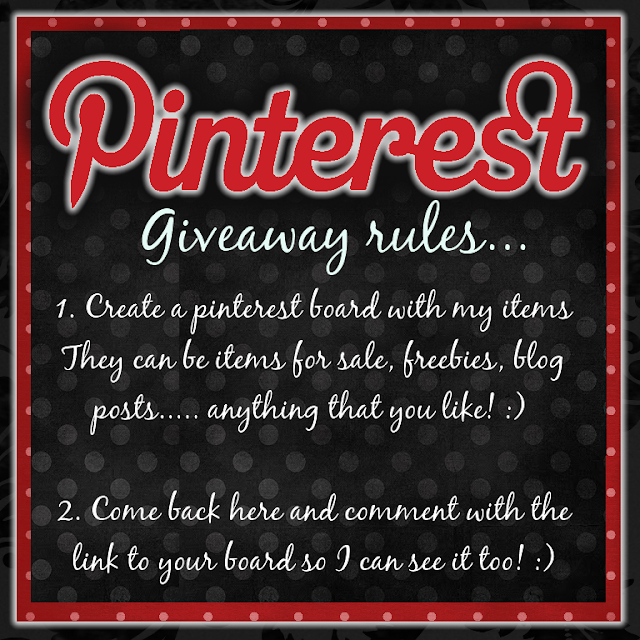 So go create your board and go to "current giveaways" on the top of the blog or by clicking HERE and leave me the link to your board! And of course you want to know the prizes!!! I will even let you pick!!! Choose from a layout with a theme of your choice or a set of journaling cards for your own scrapbook pages. Thanks so much! I am so looking forward to this!!! Hi! Just found your lovely website and thought I would try for the giveaway in hopes that this time I will win something from someone...LOL! I have much more to add! love a good giveaway, problem is all of my faves from you I already had pinned, hee hee. Thank you for offering such a nice giveaway~ I follow you on FB, GFC, email and pinterest! Thank you for your beautiful givaways, here's my link. I think there is nothing better than giving a home-made and beautifully wrapped gift, it shows that thought and care have gone into the giving. I love theseitems you do they are truly amazing. I have pinned it on board at http://pinterest.com/juliemoo1960/pins/ which hopefully will work OK.
You are amazing!! I love your work and website. I am new to scrap booking. Close friend and I made christmas cards last weekend, I learnt lots and enjoyed myself plus the end results. I do lots of other craft including preserving and candle making. I'm also getting married in January so any wedding diy ideas would be appreciated. I am always on the look out for good label temples and yours are the best. Am so glad it have come across your website which I found via Pinterest. You've changed my life. I have started a board but will pin more later. Two night staying up past midnight is a bit much for this crafter.